We have a finite number of pages to bring you each month, one might say a tightly controlled number. That number has never easily accommodated the quantity of fresh, relevant GNSS and PNT news and technical material that emerges each month. The pace of your developments is too fast with which to keep up! 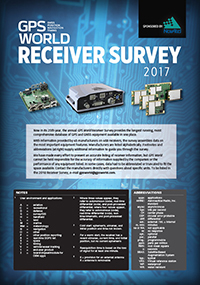 2017 GPS World Receiver Survey (PDF). This month, a case in point. Most importantly, driving the whole issue is the latest, greatest version of that long-running industry resource and guide, the GNSS Receiver Survey: 24 data-packed pages of it! 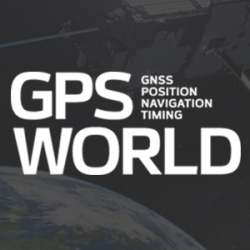 There is a major GNSS milestone to report, one which I have personally awaited since the year 2000 — and I know many others have also. When I signed on at this publication, my first assignment was getting its little sister magazine out the door: the summer 2000 issue of Galileo’s World. For four years we published that optimistic quarterly. There was plenty of content for it, but the constellation itself, and the market to support it, were slower in developing. No longer. With the Declaration of Initial Services, reported in the System of Systems section, Galileo is truly and fully open for business. This month, we also report a momentous satnav development that is not GNSS in the traditional sense, but does come from a globally orbiting constellation. 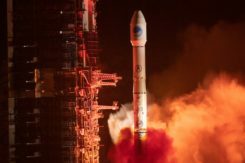 Adding signals from ranging satellites in low-Earth orbit to those from GNSS satellites in medium-Earth orbit provides just the kind of augmentation and backup that many applications critically need. The advantages come primarily in the timing realm, but there is potential for significant positioning benefits, especially once you many innovators out there get your hands on it and combine it with inertial. A true PNT powerhouse. I haven’t even gotten to this month’s cover story yet: a technical advance in multipath mitigation that has the potential to amp the power, so to speak, of GNSS receivers in many applications. Correlator beamforming is an intriguing new development. Scientists at the Air Force Institute of Technology put it through its paces, and report good results. At the risk of giving short shrift to any of these essential stories, not to mention the multiple new products, partnerships, application advances and technology updates that appear in smaller bites, we have opted not to omit any, but to cram them all into the one knowledge-laden issue. We may not be the New York Times, nor can we approach that venerable publication’s mission, reproduced here. But we have our own — All the News That Fits! Brian in Oklahoma sent me a four-word email in response. “The end of time,” he wrote.